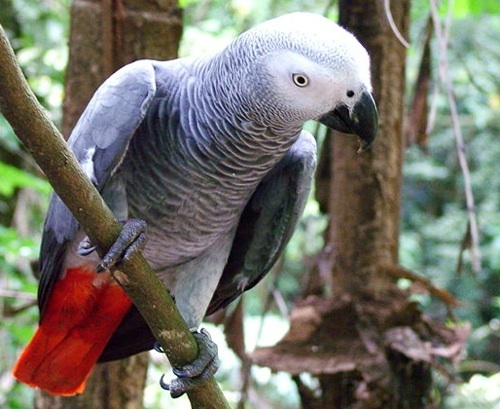 A new trade in parrot heads and tail feathers is adding to the pressure on the world’s wild population of African Grey Parrots, which is confined to the tropical forest area of West and Central Africa. This is highlighted by a recent post by the World Wildlife Fund (WWF) from Cameroon, which reports on a suspect arrested by game rangers who was found to be carrying 353 parrot heads and 2000 tail feathers. The suspect stated that he had collected the material for a witch doctor who was treating his mentally ill brother. The African Grey Parrot (Psittacus erithacus) is a medium-sized parrot, endemic to the rainforests of West and Central Africa. The birds are highly valued for their beauty and ability to mimic humans – they cost a minimum of US$ 500 each. Between 1994 & 2003 more than 450 000 parrots were captured and exported under controls that required a permit from a national authority to certify that the export was not detrimental to the species in the wild. However, this trade along with illegal capturing, exceeding of quotas and other demands resulted in considerable stress on the African Grey populations. As a result and following investigation, the Convention on International Trade in Endangered Species of Wild Fauna and Flora (CITES) recommended zero export quotas for several range states and decided to develop regional management plans for the species. In particular it recommended a two-year ban on the export of African Grey Parrots from Cameroon. It is interesting that the United States and the EU have banned the import of wild caught parrots since 1992 and 2007 respectively. This introduction of regulated trade does not effect the illegal export of African Grey Parrots, which is apparently quite well established although very inefficient. For example, it is believed that about 15,000 birds are taken out of the Lobeke region of Cameroon every year but that almost half of these die in transit due to poor handling. Unfortunately this kind of trade is likely to flourish as the financial difficulties of the world bite deeper and the unemployed poor in Africa become more and more desperate. Interestingly a search of ebay, shows that there is a substantial trade in the red feathers of the African Grey. The feathers appear to be used for craft and fly fishing. On 24/01/2009 there were 16 auctions for feathers with one seller parrotinthegarden having 125 feathers on auction, supposedly molted by his African Grey Pandora! These feathers sell for from 50c to just over a dollar each. Another person sells African Grey Tail feathers as “Pluma De Loro Africano” for religious purposes at US$ 7 each! Photo credit: Michael Gwyther-Jones on Flickr under a Creative Commons License.